Fajitas are a popular Tex-Mex recipe that originated using grilled skirt steak. You can make 10 Minute Skillet Fajitas using grilled skirt or other steak like rib-eye or tenderloin or chicken. Shrimp fajitas are also popular. This simple recipe is based on the original concept. For added flavor the skirt steak is marinaded, but some fajitas taste like they were marinaded and cooked in a gravy. Gravies and sauces are inexpensive ways to quickly enhance the flavor. When you do not have a lot of time the KISS (keep it simple stupid) method of cooking is best and healthiest. To reduce fat and calories, my preference is cooked chicken breast meat. I use leftover rotisserie chicken, frozen grilled chicken breast or grilled chicken for this recipe. Using cooked chicken or beef reduces preparation and cooking time. The meat is combined with grilled onion and bell pepper and wrapped in warm flour tortillas. You can make and eat fajitas as is or add a variety of condiments like shredded cheese, sour cream or unflavored yogurt, salsa and guacamole. The meat mixture in a 8-inch flour tortilla is about 200 calories. Condiments can add another 100 calories. 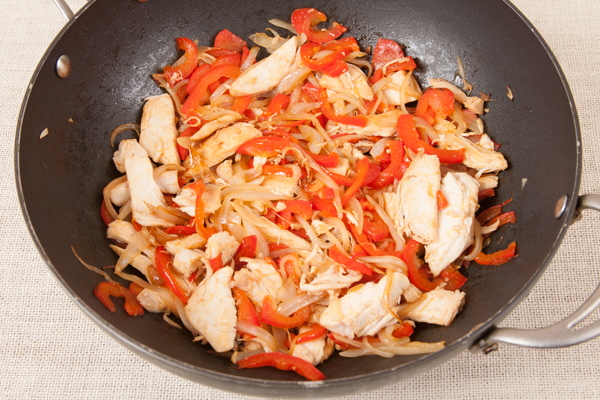 Using cooked meat, onion and bell pepper, and a large skillet or wok you can make enough filling for 6 to 8 fajitas in about 10 minutes. I like lots of healthy onion and bell pepper, but you can adjust the ratio of meat to vegetables to your taste. Nutrition facts are for reference only and will very considerably depending the brand of tortillas used, any added salt, and number and type of condiments (cheese, sour cream, yogurt, salsa, guacamole). Homemade salsa and guacamole can be very low in sodium compared to prepared brands. Non-fat yogurt has about one-forth the calories of full-fat sour cream. I do not recommend reduced fat sour cream due to the number of chemical additives used by many brands. Preheat oven or toaster oven to 300°F (175°C). Tightly wrap tortillas in aluminum foil and heat 5 to 8 minutes or until warm. 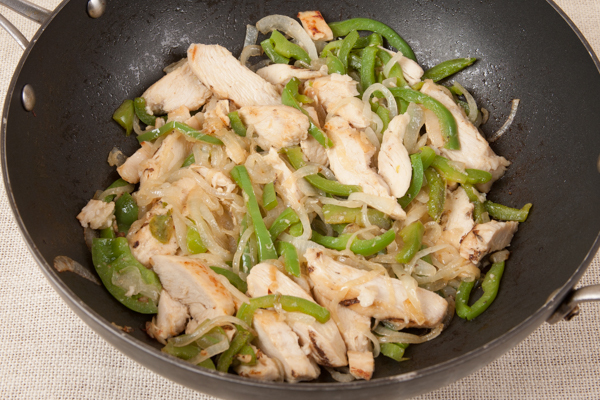 Heat oil in a large skillet or wok over high heat until it begins to simmer. Do not let the oil smoke. Add the onion and bell pepper and cook 2 to 3 minutes without stirring or until browning/caramelization begins. Stir 3 to 4 minutes to lightly brown and soften vegetables. Stir in chicken and cook stirring constantly until chicken isi heated through and begins to slightly brown. Do not over cook. Take a warm flour tortilla. Add about 1 tablespoon (15 ml) of guacamole and/or yogurt. Add cheese if desired. Add the chicken filling and if desired salsa. Fold one edge partially over the filling and then fold in the two sides.